Are you looking to give your business a fresh new look this year? Here are questions to ask before you rebrand. So, it’s THAT time of year, the beginning, where everyone starts planning, reorganising, refocusing and looking to the new year, setting goals and aiming high. Maybe you’re not doing that, maybe you’re like me, still on holiday and haven’t over planned the pants off the new year yet. My intention – to set some goals for the first 3 months and if new things arise as I go then I will go with the flow. Don’t get me wrong, As a branding designer and an entrepreneur, I’m a planner. I love a good goal and a to do list. But this year I’ve kept things simple. One notebook split into my own sections I’ve sectioned off – goals, blog, social media, content, new products, freebie ideas and marketing. Then on a white board, my new products/services I intend to launch, with my BIG WHY written on it and how many products/services I need to sell to meet my financial goal for the year. And that’s it. Super simple. Within my plans I wrote down ‘rebrand’ with a question mark beside it – cause I’m not sure. I have plans to do great things with my business, so I’m questioning if I need one to allow my brand to grow. Is now the right time for a rebrand? I specialise in branding design for women, so I know from experience that rebrands can be expensive, I know this from experience, especially if you have a physical business and you sell branded products, or if you have shop signage, leaflets, brochures, clothing – I mean the list can go on and on. If you’re swithering over a rebrand, I want you to ask yourself these questions to ask before you rebrand. Are you proud of your current brand? Does it still represent you and your services? How does your branding compare to others in your field? Does it speak to your ideal customer? Only once you can answer these honestly, should you consider a rebrand. And let your answers sink in. If you still come back to, “yes – I really think my brand no longer serves me” then it’s probably something you should stick on your goal list for the year. The main reasons most small businesses choose the New Year to rebrand, and it might be yours too, is it to accommodate a change in direction? Target a new customer? Ditch the DIY? Want to look professional? Want to stand out and shine? Time to charge your worth? Have a brand that radiates your passion? The New Year is also a great time to breathe new life into your business – a rebrand actually re-energises your businesses – creating positivity and a new zest for your business – you might have fallen out of love with your business and you want to fall back in love with it all over again. Whatever it is – it’s your reason. Also check their social media page, are they showing up themselves? Do they post what they preach? Check on and offline options, you might want to work with a local designer but then discover someone online – skype, phone and email work a treat you know! Research and get clear on everything before you commit. If a rebrand is one of your goals this year then I totally recommend doing a little homework first, then take it from there. It doesn’t have to be rushed – just take your time. Getting it right is crucial to the overall success of your business and has a massive effect on how you feel about your business too. So should you rebrand? 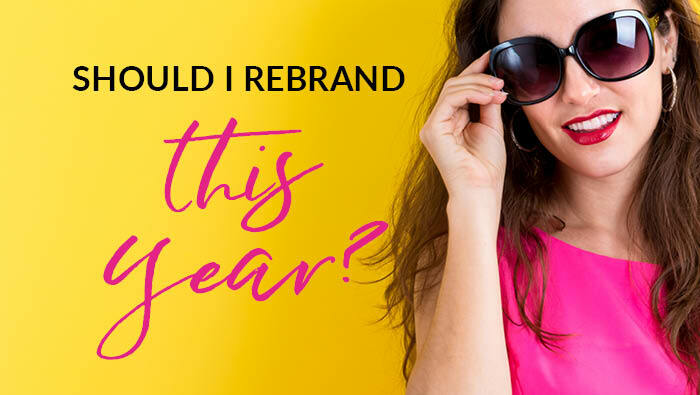 Find out more here on another brilliant blog: Should I rebrand my business? and What questions should I ask my graphic designer? Until next week – happy branding – and HAPPY NEW YEAR – I hope your new year rocks!